My current research interests center on the use of computational methodologies to investigate the molecular mechanisms underlying information processing within bacterial chemotaxis. 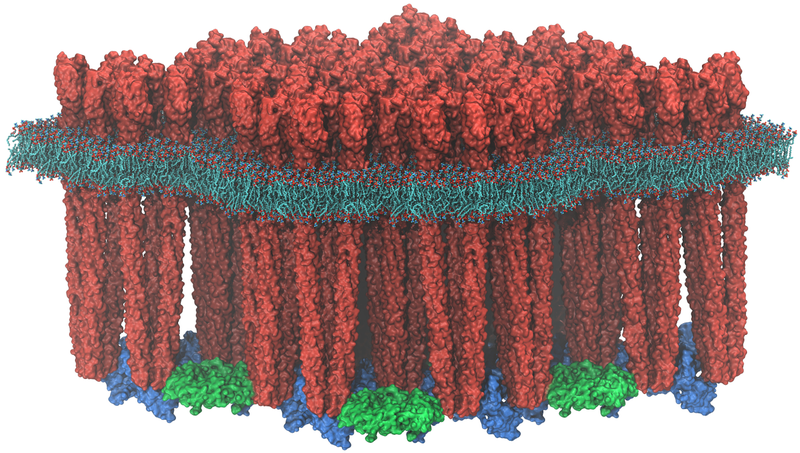 In particular, I’m interested in the use of modeling and simulation techniques such as molecular dynamics to characterize the molecular structure of the bacterial chemosensory array and to describe, in atomic detail, signaling events within its constituent proteins. Read more about bacterial chemotaxis and the chemosensory array here. The chemosensory array is a highly-ordered complex of signaling proteins, including chemoreceptors and kinases, which sense and process environmental chemical information to affect the cell’s swimming behavior. Despite great strides in our understanding of how these signaling proteins fit together, a high-resolution description of the sort needed to explore in detail the molecular mechanisms of signal transduction has remained elusive. In collaboration with Peijun Zhang’s lab, now at Oxford University, I and colleagues at the TCBG integrated experimental and computational techniques to derive the first atomic model of the extended molecular structure of the Thermotoga maritima chemosensory array (paper, movie). In addition, our model permitted the use of simulations to identify a novel conformational change in the CheA (KEY aye) kinase (movie) affecting cellular behavior in Escherichia coli. You can read a story on the work by the Illinois News Bureau here. Currently, we are further exploring how specific conformations of CheA structure are linked its activity as well as the ways in which receptors can communicate with CheA to regulate signaling. Chemoreceptors bind environmental chemicals and transmit this sensory data across the bacterial membrane to be interpreted by the chemosensory array. 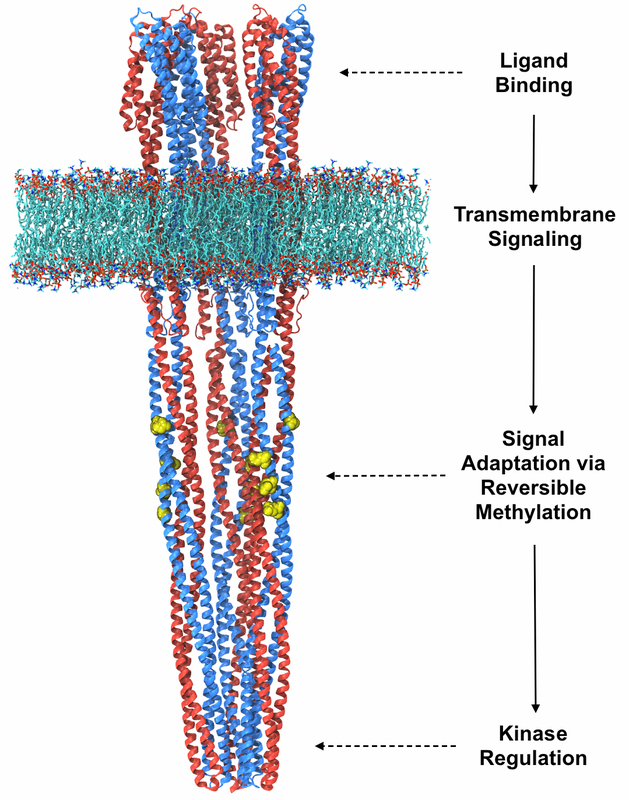 Though the subject of intense study for several decades, many features of chemoreceptor signaling remain unknown. I’m interested in the use of computational techniques to characterize key structural and signaling features within bacterial chemoreceptors, specifically, through the construction of molecular models for the largely unknown transmembrane four-helix bundle and intact trimer-of-chemoreceptor dimers structures. These models will extend the analysis of transmembrane signaling within chemoreceptors and permit an investigation of the ways in which receptor methylation affects the structure and dynamics of chemoreceptors during the adaptation process. The eventual combination of these two, multi-scale lines of investigation, i.e., the high-resolution characterization of the extended chemosensory architecture (global scale) and atomically-resolved details of signaling events within and between individual receptors and kinases (local scale), should help to shed new light on the origins of the mysterious cooperativity underlying the amazing information-processing features of bacterial chemotaxis.